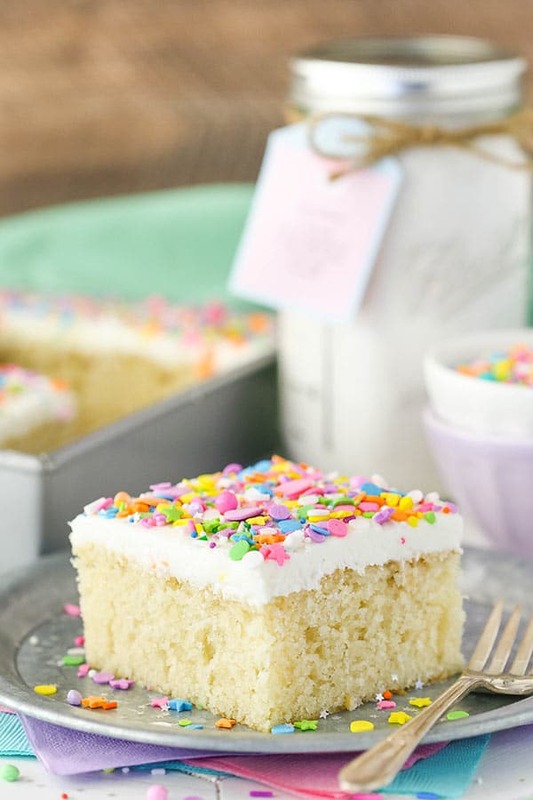 This Homemade Vanilla Cake Mix is super easy to put together and store in your pantry for those days you want to put together a quick, delicious vanilla cake! Make several to keep on hand – or to give as gifts. I’ve even included a cute little tag you can print out with the ingredients and instructions for baking later! We all have those times in life that are super busy and we need a little shortcut. Baking can even be one of those things we need a shortcut with. 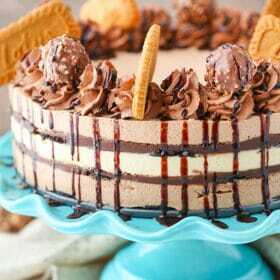 Though I love to bake and enjoy the process of putting everything together for a wonderful cake, there are times that I just want to grab a mix out of the pantry and have part of process already done for me. 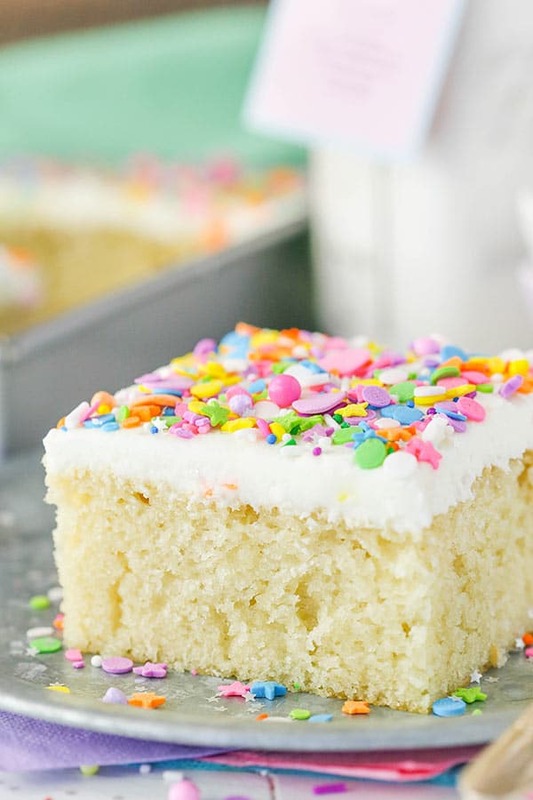 This cake mix is perfect for those days! Once your mix is ready, feel free to download and print the tag to add to it so you have the ingredients list and instructions handy when you’re ready to bake it. It’s a straightforward mix, which is perfect for a cake mix. No need to cream anything – just combine and mix together! 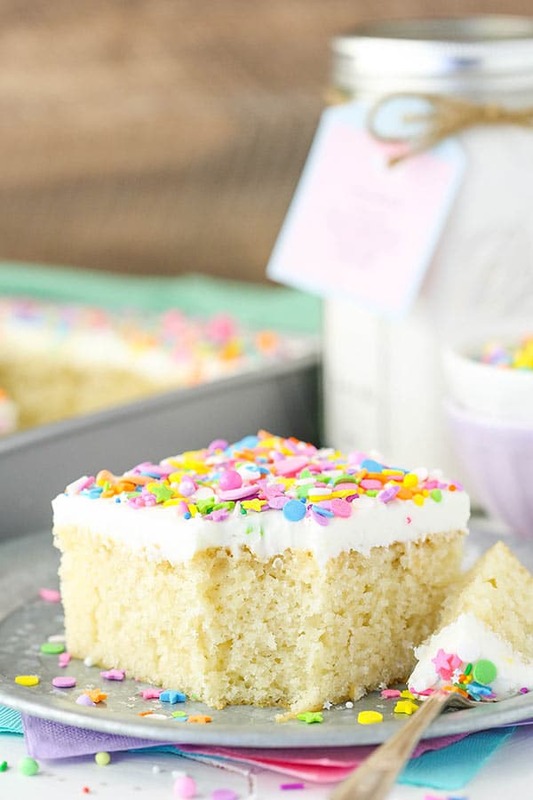 It bakes up into a lovely and super moist vanilla cake! I love how simple it is to make and the 9×13 size is great for something quick, easy and transportable if you feel like sharing. 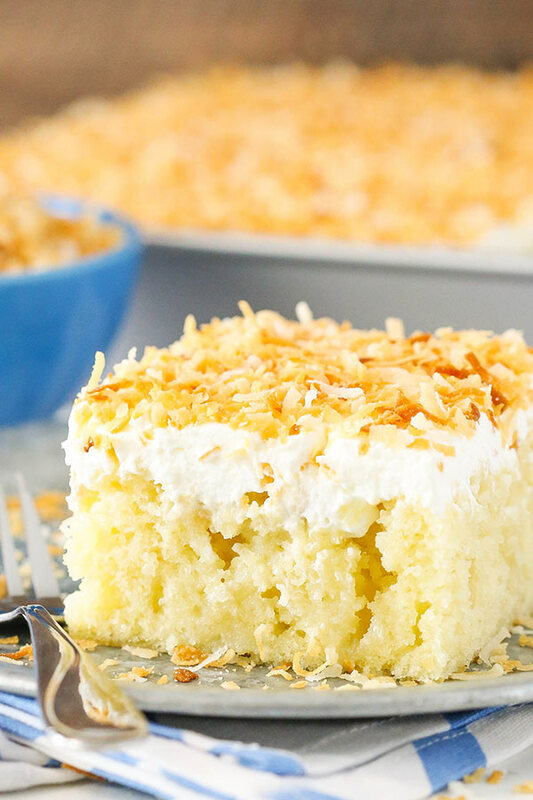 🙂 Is there anything better than a quick, easy cake to get your fix? 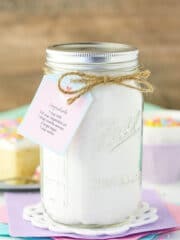 This Homemade Vanilla Cake Mix is super easy to put together and store in your pantry for those days you want to put together a quick, delicious vanilla cake! 1. 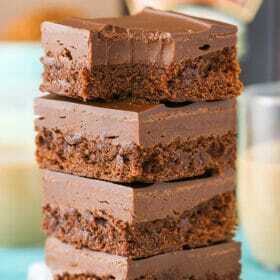 To make the cake mix, combine the dry ingredients and mix well. 2. Add the dry mix to a large sealable container. I used 32 oz mason jars. Seal and store until ready to make. 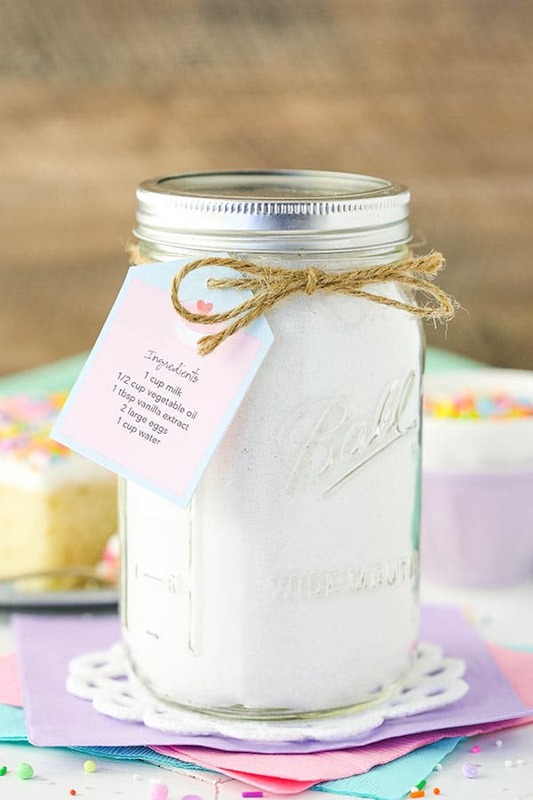 Print the tag with ingredients and instructions to add to the jar. 3. To finish the cake, preheat oven to 350°F (176°C) and grease a 9×13 inch cake pan. 4. Add the milk, vegetable oil, vanilla extract and eggs to a medium sized bowl and combine. 5. Add the wet ingredients to the dry cake mix and mix until well combined. 7. Pour the batter into the greased cake pan and bake for 28-32 minutes or until a toothpick comes out with a few moist crumbs. 8. Allow the cake to cool and frost it with the Vanilla Buttercream Frosting. This is perfect, thank you! May I ask where you found the I ♥ cake spoon? Yes – on Etsy. 🙂 Last I checked the shop I got that one from has taken a break. There are quite a few other options though. Hi Lindsay, the cake looks absolutely yummy! Have you tried making it with melted butter instead of oil? I love the flavor that real butter gives to a cake. Thanks so much, Olga PS I love your blog! So many pretty pictures and easy to follow recipes. The videos are amazing too. I haven’t tried the butter, but I do think it would affect the outcome of the cake. I absolutely love this recipe – what a great idea! I am mixing it right now 🙂 Do you know how long it keeps? I am guessing the baking powder loses it’s potency after a few months? Also i made your champagne cupcakes for Valentine’s Day and they were a HUGE hit! Yea, it would depend on the baking powder. Usually it can last for quite a while. I’d think at least a few months, if not more. 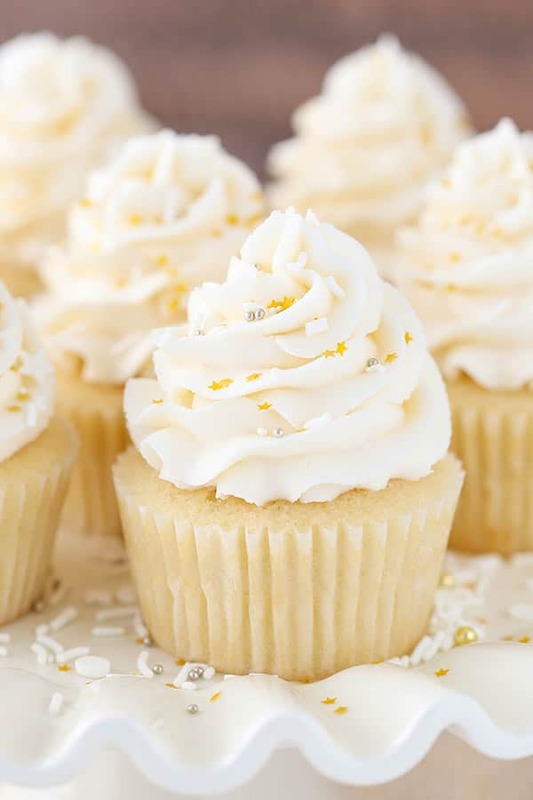 So glad to hear you enjoyed the champagne cupcakes! No, it’s already moist without it. You would add to amp up the flavor and moisture, but it will be moist without it. much for sharing them with us. You are truly a gifted young woman. Awesome! Thanks Leatha! So glad to hear you’ve enjoyed everything! This is so cool Lindsay! It would make a great gift! I’ve been wondering if you have a recipe for a three layer vanilla cake where I can use 9 inch cake pans, as these are the only ones I have. Thanks! You can try any of the vanilla cakes on the site in 9 inch pans, you’ll just need to adjust the baking time. I like to use three 8 inch pans. You’d probably only need two 9 inch ones. The cakes would just bake a little longer. who needs this for busy days? I am keeping it for everyday. It so simple to put together. thanks for sharing. Wow! What a neat, fun, and cute idea! Thx much for sharing! Never heard of homemade cake mix before! Once this cake is baked do you know if it can be frozen? I haven’t frozen it, but I’d imagine if it’s well wrapped it’d be ok. I always recommend defrosting in the fridge, too. I haven’t tried it, but I would think if well wrapped it’d be fine. Hi Lindsay, thankyou so much for this idea. I was wondering, do you think the cake would come out fine if I used 1 cup buttermilk, 1 and 1/2 tsp baking powder, 1 and 1/2 tsp baking soda instead.? For another cake recipe, i had accidentally combined sugar with the flour, baking soda and baking powder, instead of creaming the sugar with the butter first. Then I came across your cake mix where the dry ingredients are mixed first. Please help! I’m not sure, having not tried it that way. If you already have some things mixed together and don’t want to waste it, it’s worth a try. Hi Lindsay, its me again. Just wanted to say I did it with buttermilk, 1/2 tsp baking soda and 1tsp baking powder. It came out great! I made it for my daughter’s birthday and she liked it very much. 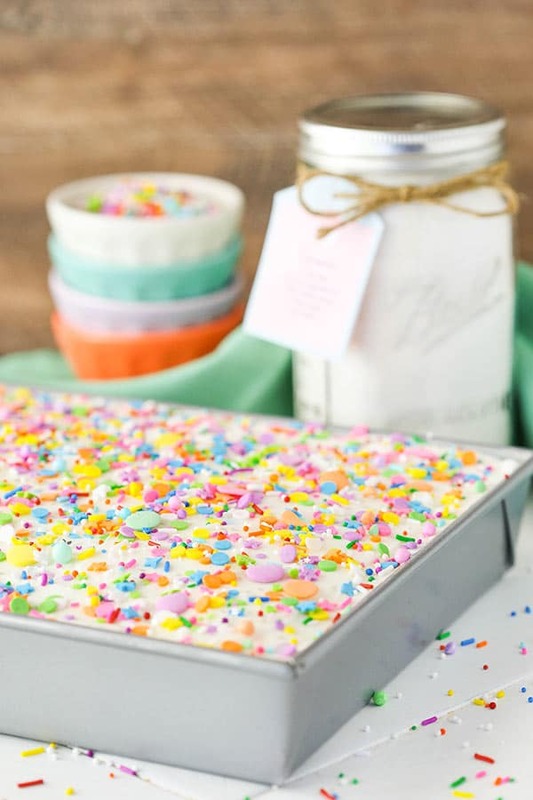 Thank you so much for sharing this cake mix idea. God bless. So glad you enjoyed it! Thanks Ann! Yes, it’d actually be quite a tall 6 inch cake. I’ve used to make an 8 inch. Hi! Would this be enough to bake 2, 8 inch round cake pans?? Thanks so much!! Yes, you could two or three 8 inch layers. Or enough to use in a 10×2 inch round? The round cake pan reads 10×2 IN/ 25×5 CM What would you recommend for bake time? Thanks so much! I’m not sure about the 10 inch pan. It might be too much batter for one layer. WAYYYY too much salt!! I followed the recipe exactly and it tastes way too salty! Hi, I followed this recipe exactly and my cake came out rubbery with some of it looking waxy and undercooked even though it was fully cooked. It also turned out alittle too thin for a sheet cake only measuring an inch. I used a square 10 by 10 inch tin. Do you know what I did wrong? By the way I made the giant triple chocolate M&M cookie and that turned out perfect. I love your site and amazing baking recipes! I have a 6 month old son so I’ve been practicing recipes when get a rare moment to make for him when he’s older! I’ve made this recipe in many forms and not ever had that issue. I know some people have described a similar result but without being able to recreate it, I really don’t know what the problem is. I’m sorry! 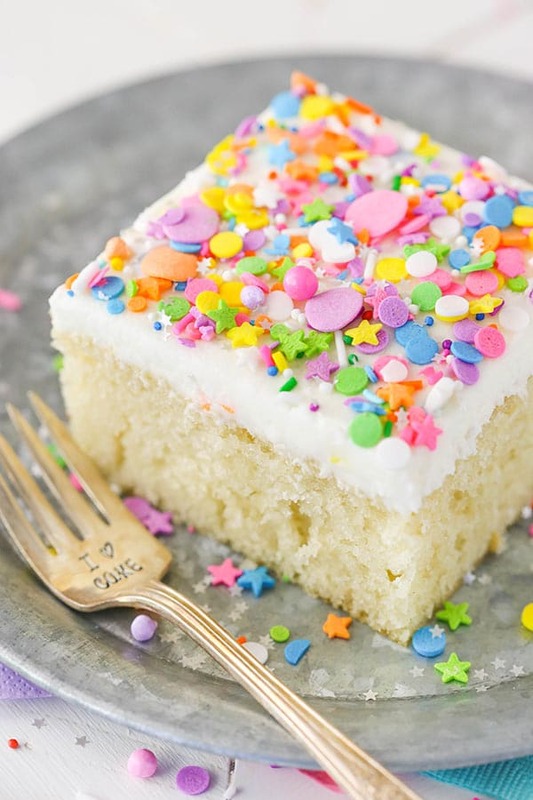 You could try out this cake, just leave out the almond extract and sprinkles. I’m glad to hear you enjoyed the cookie cake! i make a cake mix cookie that i want to try with a homemade mix. Have you tried this as a cookie? and if so, just less liquids? I haven’t tried this one as a cookie. I’m not sure without playing with it. You’d definitely need to reduce the liquids though. Here’s the chocolate version of this cake. Is this an old family recipe, one you’ve doctored, or one you found? It’s a recipe I altered from this chocolate cake for a vanilla version, which had been requested quite a bit. I was just wondering how long this would the mix last shelved in the Mason jar? It should last for at least a month. Just have to say your vanilla sponge is a life saver, used your recipe for my rainbow cake. It was perfect. Awesome! I’m so glad you found the recipe helpful! Hello I was jist wondering if I can use less oil than that or do I need to use the exact instructions? Plz reply soon since im making it right now. Would you be replacing it with something else? It’s usually safest to follow the recipe as written, but you could always try changing it up. Hi I was wondering if I had to use milk? Or could I use something else or maybe more water? I’ve heard people having success with buttermilk, but I haven’t tried, so I’m not sure. Sorry! Hello!!! Can I use a Bundy cake pan for this receipe? I haven’t tried a bundt pan for this cake, but you could try! Good recipe, very useful for many occasions. Ive cut the sugar down about 20% to suit my tastes. Im using it as a plain base for matcha cupcakes with good success. Just curious on what I can use instead of Vegetable Oil. We no longer use it and I usually use applesauce with the box mix. I really want to make this fir my daughter’s birthday. Any suggestions? Do you know if substituting applesauce for the oil will work. 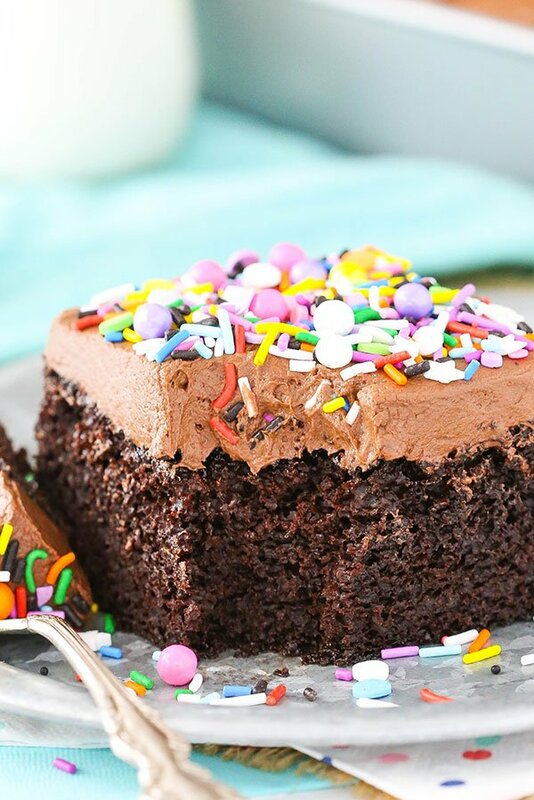 We don’t use Vegetable Oil and this cake looks amazing. I really want to make for my daughter birthday. Any suggestions or help? I don’t know. I haven’t tried it. I’m sorry! It’s definitely a very thin batter, so that sounds correct. I hope it turned out well!